BEING ONE of the top and important country in the world in terms of food products, textile, medicine, nuclear and variety of other sectors, Pakistan is still facing energy crisis from almost last 7 years having a short fall of minimum 5000 MW. This crisis will never end rather increase with every second being passed. Recently, Pakistanis has been ranked the fourth most intelligent nation in the world but still they cannot find the way to meet their energy demands. The reason behind this is the lack of good leadership, illiteracy, excessive use of fossil fuels and other political issues. Now, in these conditions the only way of survival and to overcome this problem is that we stop blaming and relying on the government or other private energy sector’s policies and start thinking to solve it by alternative methods. These alternate energy recourses are hydropower, solar, wind, waste, biomass, etc. As Pakistan having a population more than 170 M in which 65 to 70 percent are associated with agricultural field, so the handling of agricultural waste is also a big issue as well. In these conditions, Biogas production is the best and only way to overcome such problem. 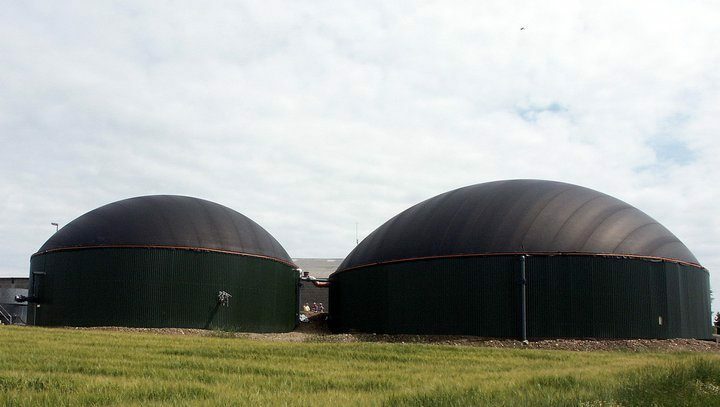 The simplest definition of the term biogas is that a gas consists of Methane (natural gas, CH4) and Carbon dioxide (CO2), which can be produced by variety of different types of waste materials. These waste materials are actually the raw materials for production of biogas which can be manure, green waste, municipal waste, sewage waste and most of all the residue of crops. The main advantage for production of biogas is that the raw material is easily available which is almost free, secondly, the product you get in terms of biogas can be used in variety of applications like cooking and electricity production and third of all, the byproduct produced in terms of slurry formation is very much suitable as a fertilizer because it contains many nitrogenous and organic matters which is preferable for Pakistani soil. So, overall, except capital investment on the biogas production plant there is no more expenditure. People living in rural areas use direct combustion technique as they are not familiar with gasification procedures. Gasification procedure to produce biogas involves fermentation technique, which is most preferably used for biogas production. Biogas production from biomass and other waste materials needs to undergo some chemical changes using anaerobic fermentation technique i.e. acidification phase, acetogen phase, methanogene phase and hydrolyze phase. In the first phase i.e. Acidification phase, the biomass, manure, and other wastes containing organic matter are converted in to broken elements and dissolved organic links such as alcoholic components, hydrogen and carbon dioxide. In the acetogen phase the broken elements are converted in to acetate (acetic acid) and finally we got the biogas comprises of methane (CH4), Hydrogen (H2), Carbon dioxide (CO2) and small proportion of Ammonia (NH3) and Hydrogen sulfide (H2S). The composition of the gas obtained depends upon the composition of feed. The quality and purity of the gas produced through fermentation process can be increased by changing the feed composition. Simply and most importantly, a digester is required to carry on the whole chemical procedure. The slurry left in the bottom can be carried out and used as a nitrogenous fertilizer. For proper digestions, a retention time of 2-4 weeks is required depending on the composition type and the production capacity. A yield of 320 m3 is obtained using isolated PFR (plug flow reactor) at normal temperature of 42oC. In Pakistan, the first biogas plant was operated in 1989 and currently up to 2-3 percent of total alternate energy produced in Pakistan is produced by Biomass. The percentage for production can be increased drastically if the 70 percent of total population of Pakistan which are related with agriculture field use gasification technique for biogas production. Up to 65 percent of them use direct combustion technique which collects wood, shrubs and other waste to produce energy. The energy produced using direct combustion technique is always less than the gasification technique and hence causing more air pollution due to emission of excess amount of unburnt fuel along with carbon monoxide and other toxic elements in air. Much research is also going on in this field in different parts of the world to make it more efficient, environment friendly and in other applications also such as fuel in vehicles. In Pakistan the BSP (Biogas support program) was also introduced by Government of Pakistan in 2000-2001, in which almost 12000 Biogas plants of different capacities were commissioned and operated but unfortunately this sector is also affected due to negligence and corruption. “Energy Deficient” label can be removed from Pakistan, if the government and the people individually pay serious attention to solve this problem using Biogas process. Climate change, man and responsibilities!